Seventeen-year-old Alexia hasn't been herself lately. Neither has fifteen-year-old Hayley. But it's not puberty that's causing the commotion. It's something a bit more complicated. Hayley (Danielle Harris, Urban Legend) is an average teenager, a grungy braniac with no fashion sense. The only thing average about her sister Alexia (Katherine Heigl of TV's "Roswell") is her grades. But there's nothing average about the sibling rivalry that explodes when a wish makes them switch places. Hayley is ecstatic: the car keys, the guys, the cool friends - suddenly they're all hers. And Alexia gets... well, Alexia gets as mad as you'd expect for a pretty and popular teenage girl in this situation. After all, life among the clueless Hayleys of the world is no life for someone blessed with a gift for accessorizing. But after a couple of days in each other's shoes. Hayley and Alexia begin to understand each other - and themselves - better. Now their biggest problem is finding a way to reverse the wish! Your regular body-swap movie. Nothing special but enjoyable. Set in 1951, a blacklisted Hollywood writer gets into a car accident, loses his memory and settles down in a small town where he is mistaken for a long-lost son. Szene aus dem Film im Film: "Wüstenpiraten der Sahara"
As Pete still hasn't watched this, I thought I would finally rewatch it again after all these years. Like then I did enjoy it, but I still feel it is a movie I cannot watch often. This is one of those movies where Jim Carrey tried to get away from his comic roles. He was good, but he did not make a lasting impression like he did with Truman Show or Eternal Sunshine of the Spotless Mind. I have watched Veer-Zaara today for the forth time. I enjoyed this fun little comedy. Some fun visuals with a nice story. Although going after the last few South Korean movies that I watched it seems to be the norm at their high schools to be a lot of big fights between students. In this pleasant romantic comedy from Korea, Jin-Soo (Lee Jung-Jea from Il Mare) is a TV weatherman who is suffering from partial amnesia after a tragic accident. Now he only has vague memory of someone he loves deeply and vows to find that woman. His search leads him to Yeon-Hee (Chang Jin-Young), his high school friend who is trying to forget her latest ex-boyfriend. With Yeon-Hee's help, Jin-Soo begins to solve the mystery, only to find that he has gradually fallen in love with Yeon-Hee instead. Over The Rainbow is both a charming and romantic mystery and a thoughtful tale about past and present loves. A nice romantic comedy about a guy, who has partial amnesia after a car accident, trying to figure out who the girl is of which he has a vague memory of being in love with her. It's a nice feel-good movie. KIM Yun-woo works as a civil servant in a district office. Although he's thirty, he's quite inocent in dating girls. After moving to a new apartment, he often runs into HAN Soo-young, a high school girl who lives downstairs. 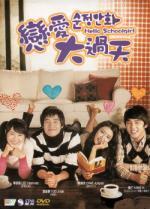 Soo-young is a cheerful and eccentric eighteen-year-old who lives with her mother. Meanwhile, KANG Sook has just started his public service in the district office. He falls head over heels for Ha-kyung because of her beautiful smile after seeing her in the subway station. Ha-kyung is still holding onto an old flame and keeps on looking for traces of that love every day. KANG Sook continues to keep wooing her, irregardless of her living in the past. Can their futures lead to a happy ending? This movie manages to make possibly scandalous relationship sweet and innocent. All the actors did a great job. Su-jin (starring SOHN Ye-jin) has always been a little forgetful. She first met Chul-soo (starring JUNG Woo-sung) at the convenience store and again when Chul-soo was sent over to do some carpenter's work for her company's showroom. A romance develops between the two, but slowly because Su-jin and Chul-soo have both been hurt in the past. Su-jin is recovering from a failed romance with a married amn. Chul-soo was abandoned as a child, and has lived his life alienated and alone ever since. Su-jin is the first to fall in love, and asks Chul-soo to get married. At first, he remains skeptical and resists, having lived too long without love in his life, but eventually, he gives in to his feelings. Su-jin's forgetfulness begins to grow worse. Chul-soo does not take it seriously, but Su-jin goes to the hospital, where she learns that she has a rare form of early-onset dementia. As her memory deteriorates, Su-jin begins to lose her connection to Chul-soo and her loved ones, and Chul-soo learns what it really means to love. This movie inspired "U Me Aur Hum", a Bollywood movie I have reviewed in the past. It is a great romance movie. The first half is a fun romantic comedy which tells how the couple meets and how they fall in love. The second half deals with the tragedy of her developing Alzheimer. Both actors did a great job in both parts. Mika is in her first year of high school. Her closest friends are absorbed in finding boyfriends, but while Mika likes the idea of being in love, she does not know how to go about it. When she meets Nozomu and Hiro, two flashily dressed boys, she turns and flees. She begins getting calls from a boy she doesn't know. Suspicious at first, Mika is gradually drawn into conversation. One day, they meet each other, Mika thinks she has been set up and turns to go, but the boy gives her a bouquet of flowers. He shows her his cell phone, with the dawn picture. A good teen-drama, though at times a little far-fetched, even though it is said to be based on a true story. At least the novel it was based on supposedly makes that impression, but as far as I know it is not really proven as the author "Mika" is anonymous.